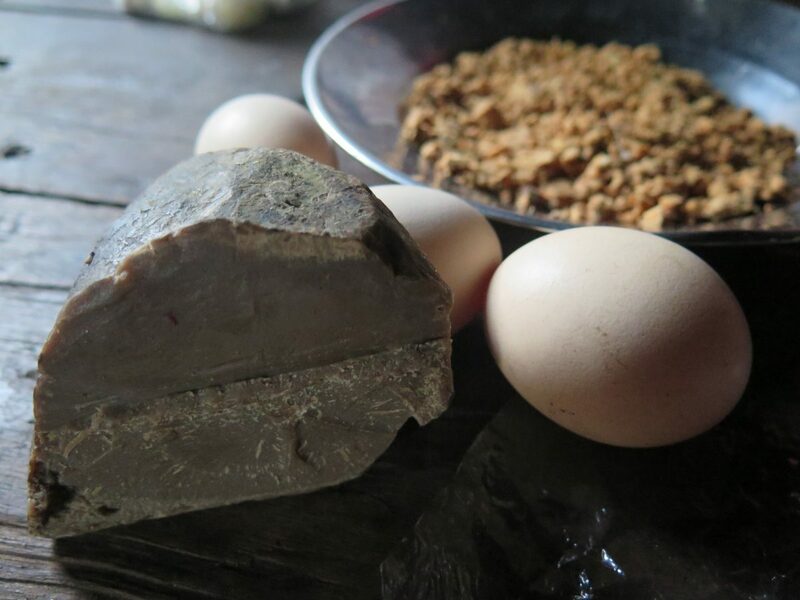 NAWNGMUN, Kachin State — In much the same way that Bamar ethnic people treat their guests to jaggery, green tea, and lat-phat-thoke (pickled tea leaves mixed with fried garlic, peanuts, sesame seeds, or dried shrimp), Burma’s ethnic hill people prepare their own delicacies which they offer to guests as a sign of hospitality. Far in the northern tip of Burma’s Kachin State, the Rawang people live. This tribe, who are part of the larger Kachin ethnic group, are spread across Nawngmun Township and in surrounding villages. Non-local guests rarely visit Rawang homes because of their remote location. When the Rawang do receive a guest, they treat them to “lar chya hka raww.” The dish is considered a delicacy, and to share it is an expression of hospitality. The lar chya hka raww is a Rawang traditional drink made with pork rinds, peanut, powdered milk, eaglewood oil, and eggs which are ground, mixed with green tea, and boiled inside a hollow piece of bamboo. “To translate lar chya hka raww into Burmese, you would call it ‘Rawang tea mix,’” said Phung Latt, a Nawngmun resident. To make Rawang tea mix, a bamboo tube is required. 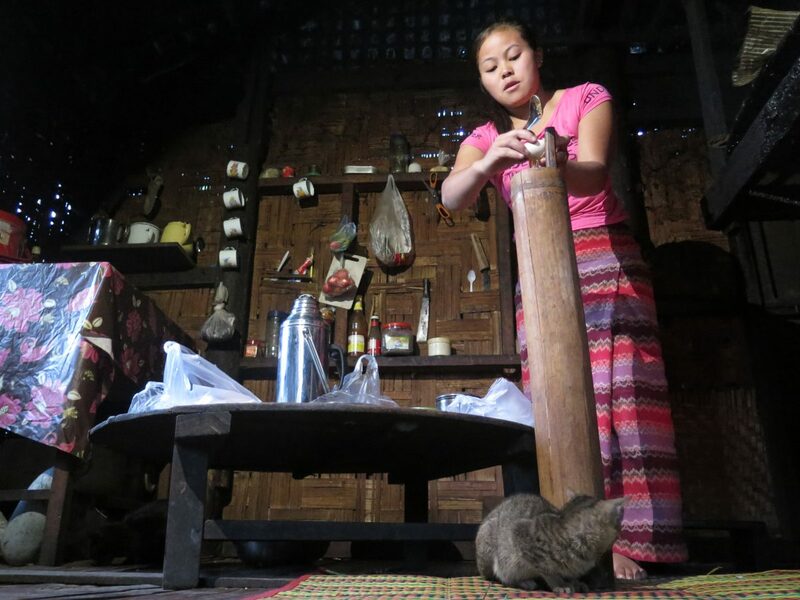 Typically, the bamboo tubes must be about 1 meter (3.3 feet) long, but some Rawang houses also use a shorter 0.3 meter (1 foot) bamboo tube as a lar chya hka raww container. The first step of the cooking process is to crack raw eggs into the bamboo tube. Then other ingredients are added—milk or powdered milk, crushed groundnut, crushed sesame, butter, eaglewood oil, and pork rind. Green tea and boiling water are added at the end. All the ingredients are mixed and ground with a square-shaped bamboo stick. After a short time, the lar chya hka raww is ready to be served. It has the color of milk, the smell of butter, and the taste of creamy milk. Although the drink might be too sweet for some, the Rawang ethnic people are very fond of it. It is their favorite traditional food. “We Rawang people love to treat our guests to lar chya hka raww. It is our way of welcoming,” said Phung Latt. In winter, the weather is freezing cold in Nawngmun Township, where temperatures sometimes drop to -17 degrees Celsius (2 degrees Fahrenheit). Rawang homes have to keep a fire burning in their kitchens to stay warm. After the Rawang cook lar chya hka raww, they can store it inside the bamboo tube in their kitchen. They might drink it when they come home from work or as a quick snack to reduce hunger. Some people also drink it for breakfast. “It is wholesome, and it can help sick people to recover more quickly from their illnesses,” said Mary, a Rawang ethnic woman. Rice can’t be grown in most villages around Nawngmun because of the cold climate, so the Rawang tea mix also serves as a staple food for families where rice is too scarce for daily consumption. Alhough Nawngmun is located just 160 kilometers (100 miles) from Putao, it takes a full day to travel between the two townships because of rough and mountainous terrain. During the rainy season, the trip can take two days. Because of the difficult logistics, the price of rice and other staples in Nawngmun is almost triple that of Putao. 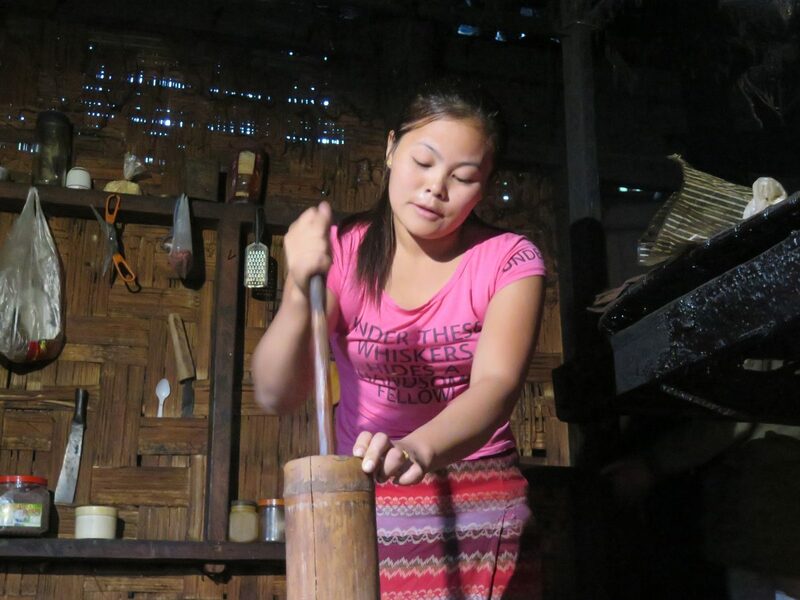 The tradition of drinking lar chya hka raww is unique to Rawang families living in Kachin State’s Nawngmun. And when they receive a guest, Rawang families will typically grab the bamboo tube and start to prepare lar chya hka raww. When the guest has finished, Rawang hosts won’t hesitate to fill their cup a second time. These people hold the common belief that drinking lar chya hka raww daily will help one to get a fair complexion, better nutrition, and strength. So they urge guests to drink more. Sometimes, Rawang families will serve lar chya hka raww along with traditional snacks such as baked tapioca. The drink remains the symbol of the Rawang people’s hospitality.